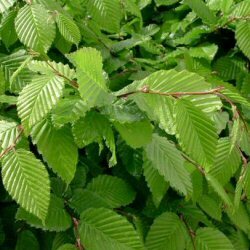 Buy Hornbeam Tree (Carpinus betulus) online from UK tree supplier of cell grown broadleaf hedges and shrubs. Native to South East England and a common sight throughout Britain, Hornbeam (Carpinus betulus) is an attractive tree frequently planted in gardens, parkland and streets. Relatively fast-growing, while young, as a result, it is widely used as a hedge. The leaves of Hornbeam are bright and glossy. Autumn sees a magical transformation to rich yellowy-orange colours. The leaves on young trees over the winter, falling in spring with the arrival of new leaves. If left untrimmed, expect a final height of 30m (100ft). If you are looking for other types of Hornbeam then click ORNAMENTAL HORNBEAM which takes you to older and taller trees. Hedging plants can be found at HORNBEAM HEDGING. Typically, Hornbeam is planted in groups of between 10 and 25 trees. This number of trees is ideal for creating a wildlife habitat and a meaningful source of food and shelter. Spacing may vary between 1m (3ft 4in) and 5m (16ft 8in). The aim is to mimic what nature intended and thus avoid artificial lines. Blending of one species into another is suggested although bearing in mind different growth rates. Hornbeam is a minor native tree species and along with the many other native, British tree and shrub species we sell will form part of an attractive native woodland. Our trees are sold as plug plants, in other words, the roots are encased in compost. This means that planting can be carried out at any time of the year, provided they are watered in periods of drought, compared to bare-root plants which can only be planted during the plants normal dormant period (November to March). All of these trees are UK grown, which is important for successful establishment.